Not too long ago, Ghanaian Television host – Nana Aba Anamoah – was suspended by her employers, TV3 Network, for photo theft; a move many Ghanaians described as unfair and too harsh for the said misconduct. 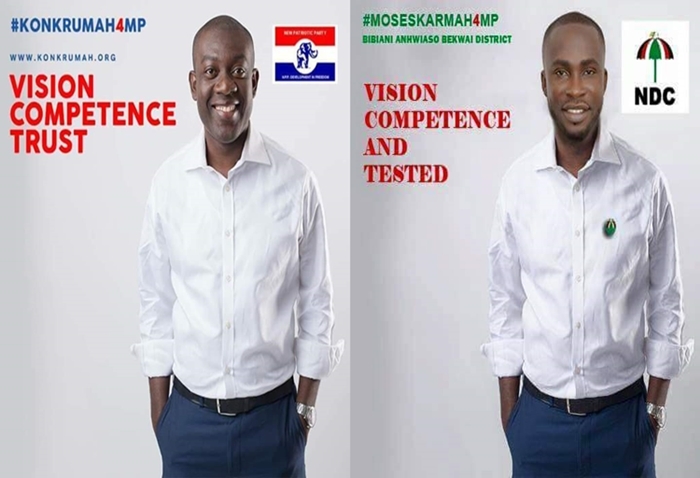 Earlier today, a poster of Moses Karma, a New Democratic Congress (NDC) MP aspirant for Bibiani Anhwiaso Bekwai District, surfaced online on various social media platforms. To the surprise of many Ghanaians, the campaign poster of the afore-mentioned gentleman was just the carbon copy of Kojo Oppong Nkrumah’s (a New Patriotic Party MP aspirant) poster, with few exceptions. The campaign poster of Moses Karma had his head nicely placed on top of Kojo Oppong Nkrumah’s body. Worst of all, the NDC MP aspirant cropped out NPP’s logo on the original poster and replaced it with that of NDC. The action which caught the attention of his party executives has been applauded by President John Mahama who doubles as the front-runner of NDC. According to him, “this is an example worth emulating.” As to why he said so, the president said if only all aspirants in NDC will photoshop the campaign posters of their friends in NPP, it will save the party a lot of money since they won’t bother hiring designers who will quote exorbitant prices to design campaign posters from scratch. The president has therefore promised the young photo-thief of an employment in his administration for being extra creative and setting a good example for other aspirants in the party. Conforming to what Moses Karma did, President John Dramani Mahama said he’s patiently waiting for Nana Addo Dankwa Akufo-Addo to release his 2016 campaign poster for him to photoshop it just like Moses Karma has done to Kojo Oppong Nkrumah.